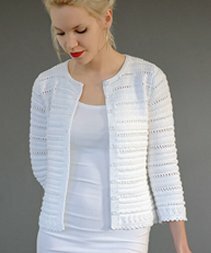 Taken from Rowan Pattern Books - Whisper: "A pretty cardigan with textured stripes." This pattern is in Rowan Pattern Books - Whisper, page 89. Size US 3 straights, US 2 straights (or size needed to obtain gauge) and nine buttons are required but not included. Finished Bust Measurements: 32 (34, 36, 38, 40, 43)". Gauge: 24 sts over 4". $93.50 -- Kit price including yarn only (no book or pattern).